Salads are a great summer side because they are easy, versatile, and full of different flavors. For a long time, I thought of salads in a few simple categories such as greens, coleslaw or fruit salad. Why do we yearn for these salads? Well, such salads or sides often hold up well in during travel — from home to an event, stay cold for extended periods of time, provide a great way to bring in some new flavors and textures, and by golly — they can be lots of fun! Personally, on hot day there’s nothing I love more than diving into a cold, refreshing fruit salad to help keep the body heat from rising. Additionally, the crunch of the coleslaw and the richness and tang of the right dressing can really provide a great contrast for all your classic summer treats. 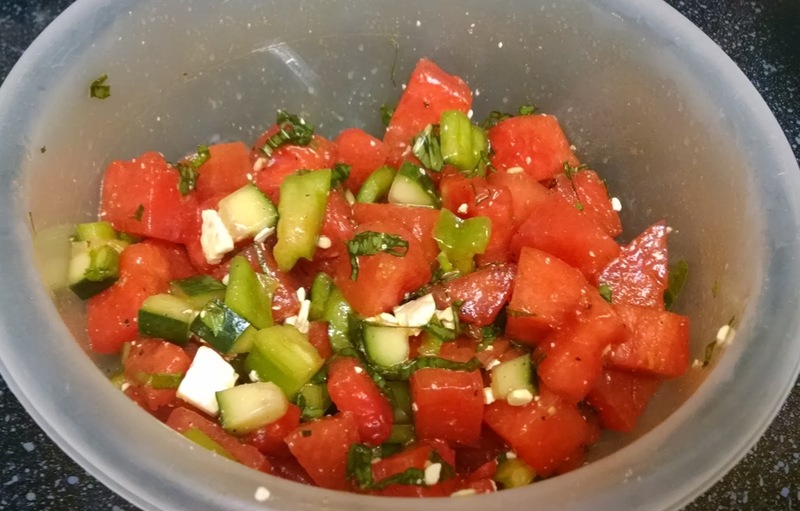 Imagine my surprise when a year ago or so, my in-house copy-editor asked if I had ever tried a watermelon salad with bell peppers and feta cheese. Immediately my mind began to calculate the odds of this being a successful side dish before I even managed to say “no.” We quickly realized that executing this salad was the only course of action. Now, in fairness, the recipe had a lot of great ideas and flavor combinations, but it was important to make sure the salad was truly ours at the end of the day. So, with some changes, a little bit of adventurousness, and some basic ingredients, we are going to put this salad into your arsenal of unexpected but delightful summer dishes. Plus, this is so light and refreshing, you hardly know you are eating a salad at all. This recipe has been adapted from Deb Perelman of Smitten Kitchen who adapted the original from Bon Appetit. For the original recipe, click the on this link http://smittenkitchen.com/blog/2008/07/chopped-vegetable-watermelon-and-feta-salad/. Ready to take your summer salad to a whole new level? Let’s do this! Note: You might find you want a little more watermelon or less bell pepper, so adjust according to your preferences. 4 oz (1/2 cup) of feta cheese, broken off into chunks, which can be added on the side for service. Toss first 9 ingredients in a large bowl. So, here is everyone in the pool together. The colors on this salad are amazing!! Stir to combine. Check seasoning and adjust if needed. Add cheese and dressing and toss until coated. Here is your finished product! This salad is so simple, but such an unexpected treat. Once you add the feta cheese, give the salad a gentle mix so you don’t break the feta chunks up too much. If you are curious about what your dressing options are, well, it could be anything. My preference is a simple vinaigrette for this salad. Big surprise, huh? My go-to vinaigrette is balsamic, of course. The balsamic provides much needed tartness and helps cut through the salty, richness of the feta cheese. Because this salad is so vibrant I don’t want to use my normal dressing because it would overshadow these great ingredients with a heavy dressing. Instead, just mix about 6 tablespoons of olive oil, 3 tablespoons of balsamic vinegar(or vinegar of your choice), a pinch of salt and pepper, and whisk until combined and emulsified. That is all you need to dress this salad. Start with a few spoonfuls of dressing, mix and taste, and add more if needed. As I said, you really want all those ingredients to shine, so a little less dressing is okay for this application. Honestly, this salad speaks for itself and is a great option for quick salad anytime of the year. This is dish best served cold! 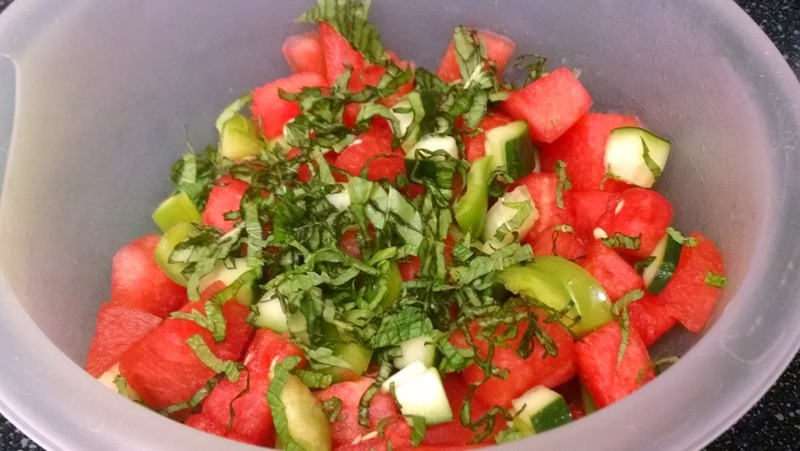 Seriously, on hot days like today, you can’t beat this salad. As usual, this is so customizable and you could certainly add a myriad of other seasonings, fruits or vegetables that fit your flavor profile. For me, this salad hits all the notes, and for that reason it doesn’t need to be fussed with too much. In fact, I have simplified the recipe quiet a bit myself because of how nice the flavors come together. This salad is sweet, crunchy, refreshing, salty, a little bit tart, and a welcome change to all of your usual summer salad suspects. Tis Strawberry Season And That Means Jam!